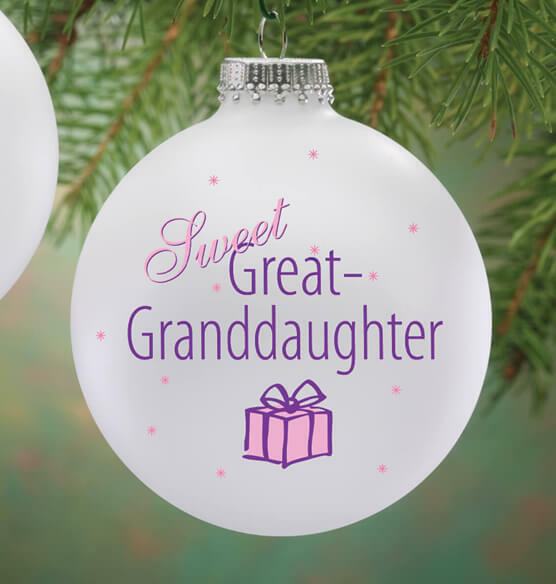 There’s no sweeter gift than a GREAT granddaughter ... celebrate her with our personalized sweet great granddaughter ball ornament that features a satin-finish. 3 1/4" dia. We’ll add her name to the back. Specify name; limit 1 line, 12 letters/spaces. I was so excited when I saw this ornament, that is so Unique (great grand daughter ) just had to have it! The ornament was great. Better yet is Customer Service! Ornament was returned because of the Grinch. Customer Service called, told me and arranged for it to be forwarded to me in Florida. A company can have the best product, best mailing and shipping department BUT if there is not a caring, kind and calm Customer Service to depend upon the company will be second rate. Hats off to Miles Kimball's Customer Service. This will be given as a Christmas gift to my Great-Granddaughter. Love the Great Granddaughter Christmas Ornament. I can hardly wait until Christmas to give it to her. A good shopping experience. Order clerk was great. Product arrived in timely manner. Product is GREAT. Hardly ever find anything with great grandchildren on it and this has great grandchildren. Looks nice. Very pleased with everything about these ornaments. Great grandchildren (and theuir parents) will love them. I was so excited !!!! I was so excited to find an ornament that said Great Granddaughter!! Not only that I was able to personalize it with her name. My grandson and his wife loved it and I'm so happy to give my Great Granddaughter something personal from Gam Gam as I am called!! Just what I wanted for my third great granddaughter. It is great for Christmas. Love this item, hard to find items for great grandkids wish date could be added to personalize with name. Iever great grandmother will want one. This item, is a wonderful gift that a grandparent could give. Absolutely beautiful. 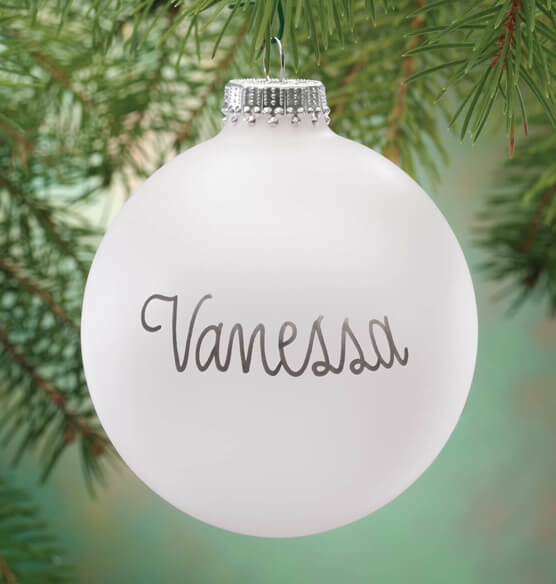 Can hardly wait to hang it on the tree. The ornament is beautiful and will be a great memory for my grand daughter and great granddaughter for ever. I was very pleased too find this item for we who are still around to love and appreciate the little treasures in our families. I very much liked the beautiful lettering and the good packaging. The 2great granddaughterornaments were just what I wanted. It's something that our Great Granddaughter will always remember us by. I bought this for my 89year old Mom to give to her great-grandaughter. she loved it. although i was worried i was not going to have it for Christmas because it was personalized and you were very busy.You came through and made my Moms christmas and i got it delivered Christmas Eve. Thank you for that!!!! Everything was great about my order except the shipping. I called and was told I had free shipping. Today I got my bill and shipping was included. $12,97.